Nice to catch the action. George keen to learn to drive the train too? @dide Yep he's got most catergaries on his license ... so another one could be handy ..
That sounds like good fun for everyone, lovely happy shot. What a great day - used to love watching it when the kids were small! Great setting! I love that water tower! How neat is that! The kids would have loved it. Nice to see Thomas the tank having a break down under !! What a fun day. I wonder if farmer George will be driving the train next year. Go FG, go. Look forward to seeing you at the controls. Oh, what fun! 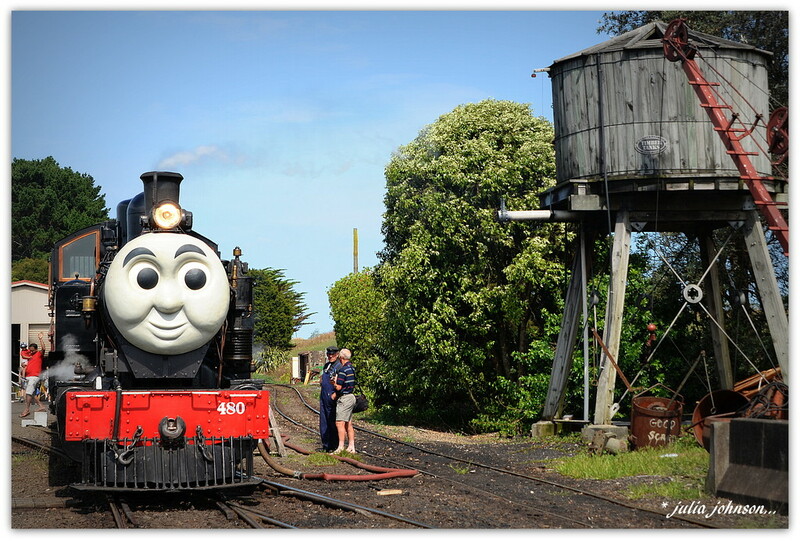 A life-sized Thomas! I can believe there were many happy fans on board!